Two additional pairs of arm sockets have been added at the ribcage and shoulder blades to allow you to add a second and third pair of arms. You will need to adjust the fit for your existing arms. The limbs or other parts visible are NOT included and is only there to model the torso. The final accessory may not match color in the photo. 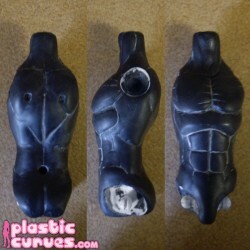 I you need this torso, please contact us. You will be required to make a minimum order, as this item would need to be remolded.